A proposed tar sands pipeline through Western Canada threatens the Salish Sea—rich, abundant border waters shared by the U.S. and Canada—and the very existence and way of life of Native tribes located in the United States. The pipeline would end near Vancouver, but from there, massive oil tankers carrying toxic tar sands bitumen must thread their way through the waters of the Salish Sea along the U.S-Canada border, where an oil spill would destroy one of our nation's most valuable ecosystems. 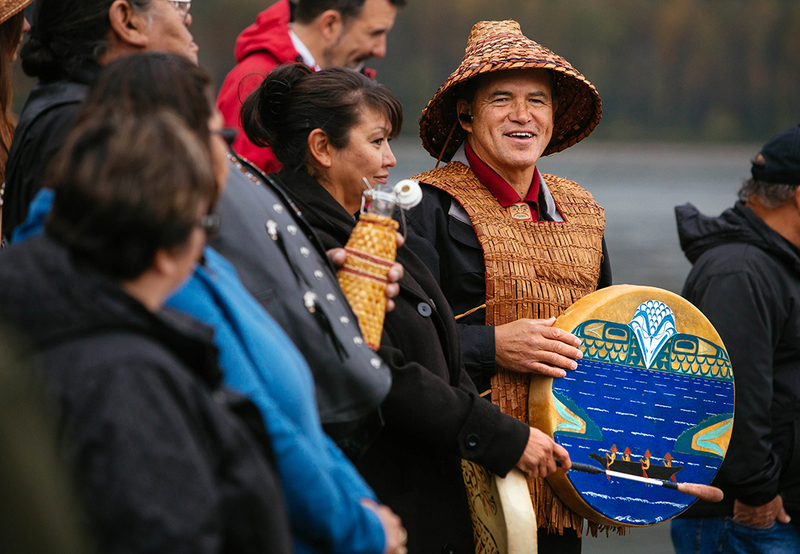 Members of the Tulalip Tribe sing along the banks of the Fraser River in Chilliwack, British Columbia, in a ceremony to honor the waters and marine life that are so integral to the Coast Salish way of life. 1 The name Salish Sea recognizes the Strait of Juan de Fuca, Haro Strait, the Strait of Georgia, and Puget Sound as a single marine ecosystem. Coast Salish tribes have sustained rich cultures from the bounty of the Salish Sea since time immemorial. 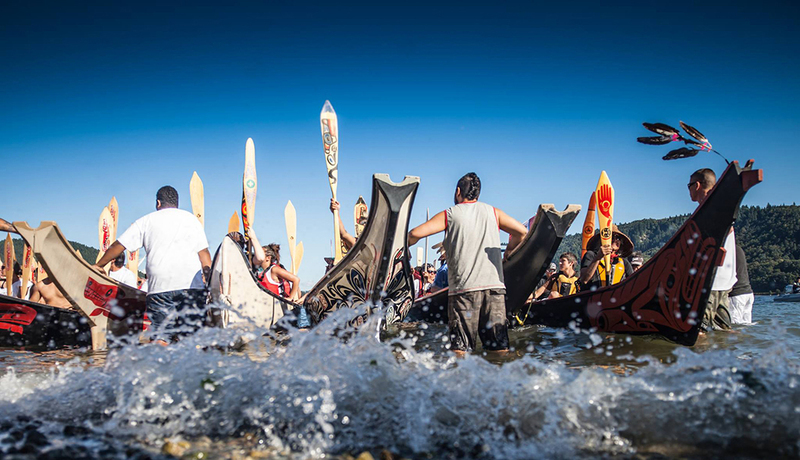 An armada of paddlers from Squamish and Tsleil-Waututh First Nations journey between their territories in opposition to the Kinder Morgan pipeline expansion, on September 2, 2012. 2 Coast Salish peoples are a group of ethnically and linguistically related indigenous peoples of the Pacific Northwest. Coast Salish tribes on both sides of the U.S.-Canada border, including the Tulalip, Lummi, Swinomish, and Suquamish nations, have been fishing in these waters for countless generations. Dana Wilson and Jim Kelly, members of the Lummi Nation, pull a chum salmon from the Salish Sea. 3 "I'm a commercial fisherman. I've been a commercial fisherman all my life. It's all I've ever done," said Dana Wilson, member of the Lummi Nation. "My father was a fisherman; his father was a fisherman; and his father was fisherman. My son is in the industry; he's fishing now on his own. My grandkids fish with me. I have 11 grandkids—the way of life that we teach our children is the water and the way to fish. In our language, it's called Schelangen—the way of life, the way of the water." 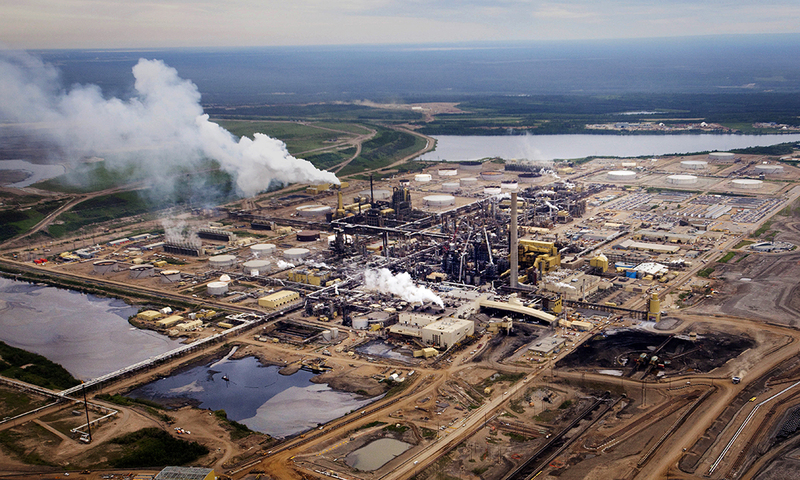 The Syncrude Canada Ltd. base plant in the Athabasca Oil Sands near Fort McMurray, Alberta, Canada. 4 One of humankind's largest and dirtiest energy extraction projects, the tar sands of Alberta, Canada, is at the heart of this pipeline fight. 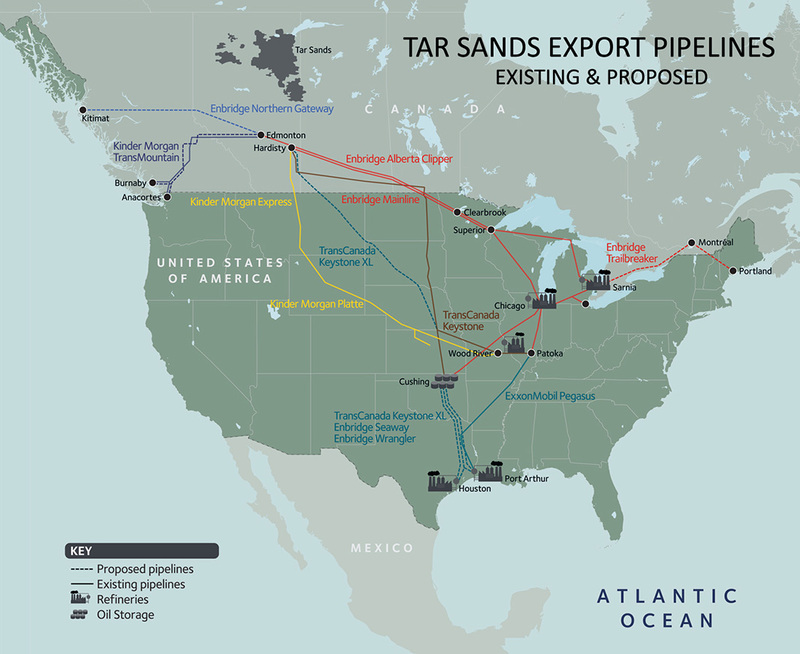 The tar sands cover nearly 55,000 square miles—an area larger than the state of New York. 5Kinder Morgan's TransMountain Pipeline system would add yet more pipeline to a system that already links the Alberta tar sands project to the British Columbia Coast, the Greater Vancouver area, and the Salish Sea. If the project is approved, the additional pipeline would bring large volumes of tar sands oil to the coastal region, where the toxic tar sands oil would be loaded onto ships and sent through the Salish Sea, which the Tribes use for commerce, food, jobs, recreation, and ceremony. The number of tanker loadings at that site would increase by nearly 600 percent over current levels. The dramatic increase in oil tanker traffic will put at risk some of the most productive salmon and shellfish habitat in the Salish Sea. Constant traffic of massive ships would put tribal fishers in harm's way and destroy their gear. Further, tankers arriving for oil loading will need to discharge ballast water, leading to the introduction of invasive species that could devastate salmon and shellfish ecosystems. 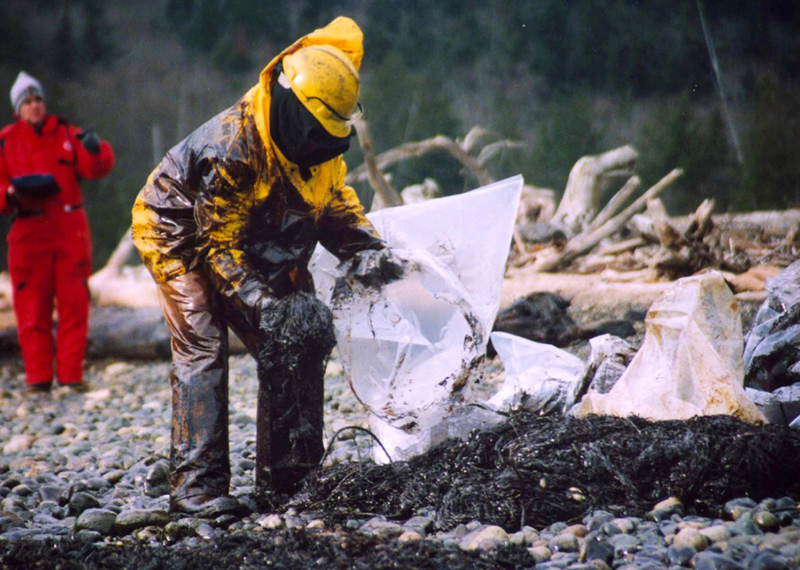 A worker cleans oil from the 2003 Point Wells spill that coated the Suquamish's area of coastline. 6 In 2003, the Point Wells oil spill occurred miles away and only 5,000 gallons of spilled, yet the oil coated the Suquamish's area of coastline, deeply upsetting the fishing, and tribal way of life, for years. The spill was small in relation to the potential that could come from the size of an oil tanker, which carry up to one million gallons. "Tribal members have used the estuary and its beach as a place of healing and worship, as well as for subsistence harvests, since time immemorial," explained Suquamish Tribal Chairman Leonard Forsman. 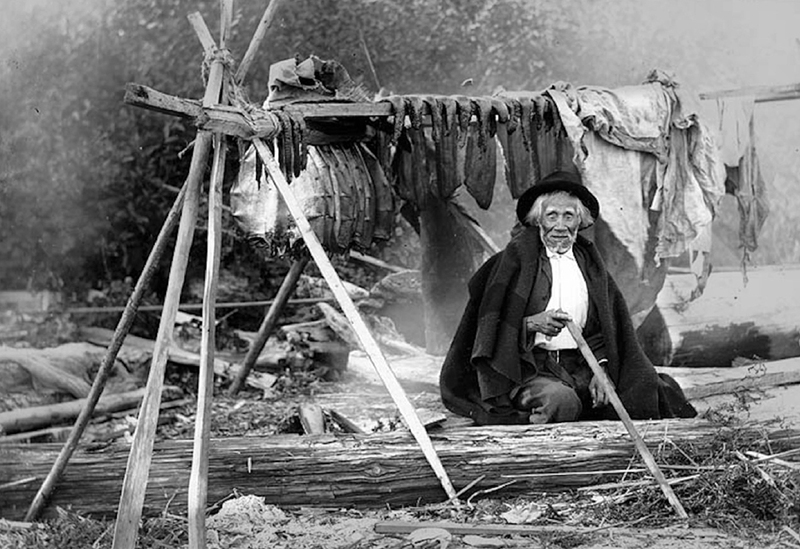 William We-ah-lup smoking salmon on the Tulalip Reservation in Washington state, in 1906. We-ah-lup was estimated to be close to 100 years old at the time this photo was taken. Native tribes lost precious much in their treaties with the United States, but that gift, was meant to be protected. 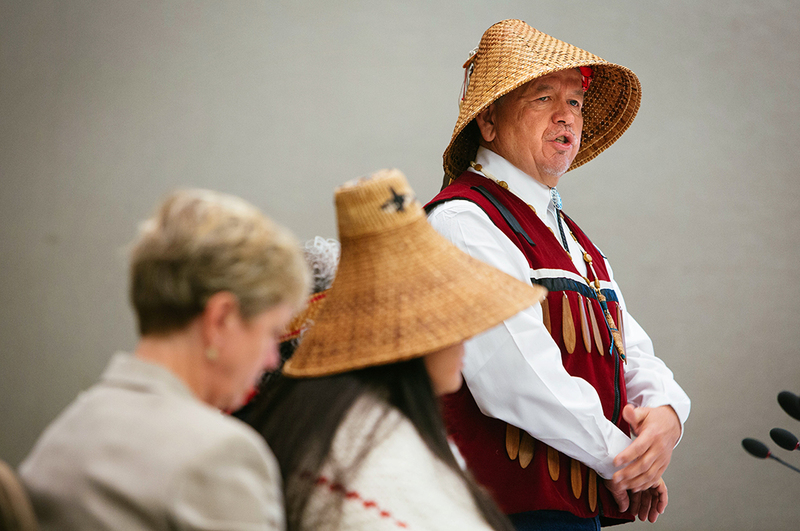 "Within the Treaty of 1855, there's a provision that was never given up, it was never negotiated away; it was retained by the tribes in exchange for many things, for housing, education, health care," said Tulalip Tribe member Glen Gobin. "The tribes ceded over millions of acres of lands from the tip of Vashon Island to the Canadian border. But they never ceded over their right to continue hunt, fish, and gather in all of their usual and custom fishing places." 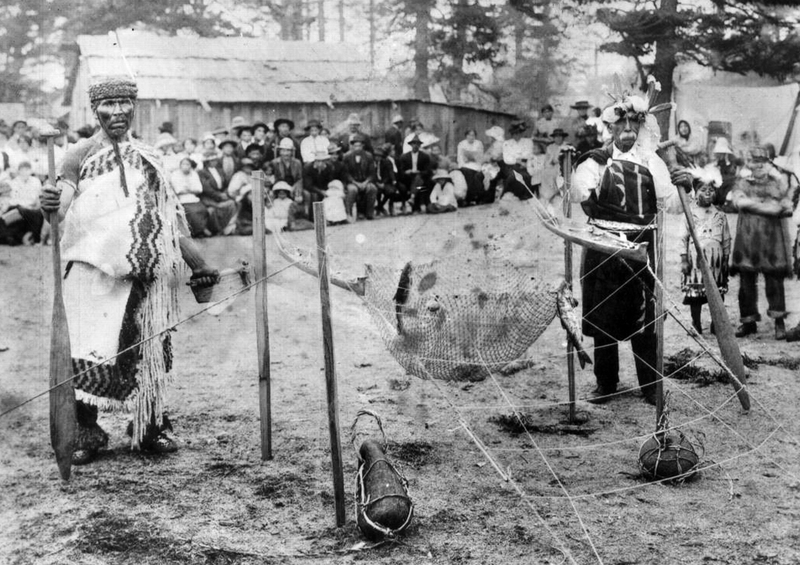 Lummi Nation members, c. 1914, demonstrate on land how a traditional Lummi reef net, called a Sxwa'la, is used to catch fish. Canoes would have been at each end of the net. 8 Since the beginning, salmon and shellfish have been the mainstays of the Coast Salish economy, diet, and way of life. Native nations fished wild Pacific Salmon with reef nets for centuries. This ancient fishing method was invented to nourish the Lhaq’temish (LOCK‐tuh‐mish), or “People of the Sea,” while protecting and preserving healthy salmon populations for many generations into the future. Today, a number of industrial activities and pollution sources severely threaten salmon populations. In addition to standing up against the threat of this TransMountain Pipeline, the Lummi Nation have joined with their Native neighbors in the region to implement numerous projects to safeguard the salmon and repair their habitat. Swinomish Tribal Senator Sophie Bailey, Swinomish members Nina Cladoosby and Aurelia Washington, and Swinomish Tribal Chairman and National Congress of American Indians President Brian Cladoosby on the banks of the Fraser River. 9 The Canadian federal government, through a recommendation from its National Energy Board (NEB), will decide on whether to permit the pipeline project. In October 2014, as a part of its information gathering and review process, the NEB heard testimony from the U.S. tribal and First Nation members. 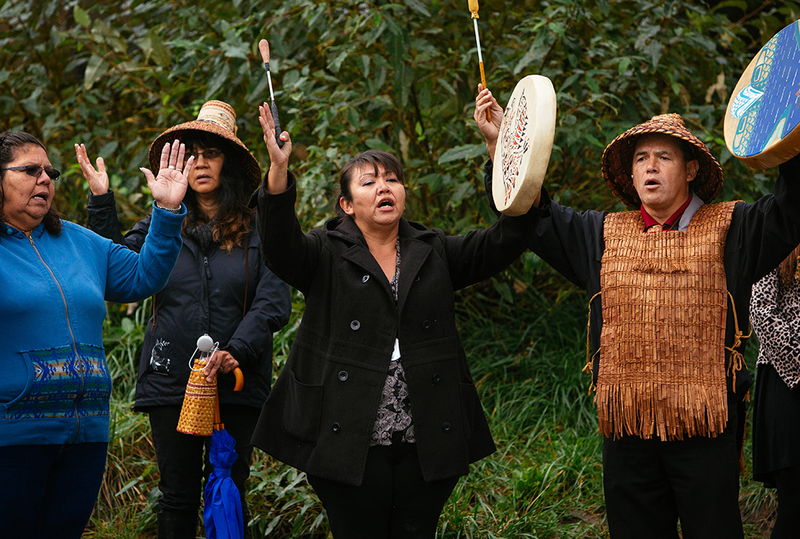 In advance of their testimony against the expansion of Kinder Morgan's TransMountain Pipeline, Swinomish and other tribal members gathered on the banks of the Fraser River for a ceremony to bring tribal members together in solidarity. "The Lummi, Tulalip, Swinomish, other tribes, and the First Nations of Canada depend on the Fraser River. Our ancestors grew up on the nearby San Juan Islands catching the sockeye that were going to the Fraser River. They had summer camps out there. My dad was born out there," Dana Wilson of the Lummi Nation explained later. "That's just a little bit of the history on how important this little neck of the woods is to the tribes. And it's all we have left. You cannot rebuild this." 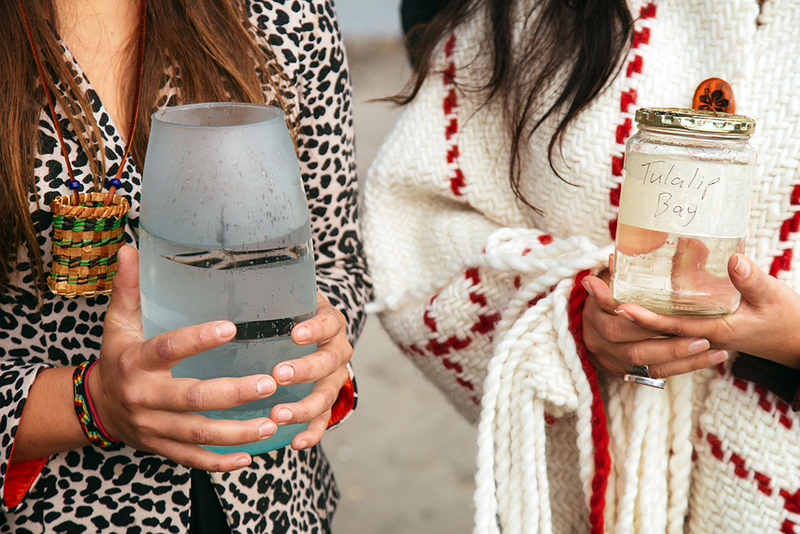 Kassia Smith and Shaylene Jefferson of the Suquamish Tribe hold water taken from their area of the Salish Sea. 10 All of the attending tribes brought water from their home waters and poured it on the banks of the Fraser River, signifying the unity of the water and the fact that water knows no boundaries. "My generation is facing the future consequences of this project. It offers nothing but the possibility of a devastating oil spill that could lead to the end of our culture, our reserved Treaty rights that my ancestors fought so hard for. Suquamish culture is not only a thing of the past, it's the present day, and it's my future. It's my children's future," high school junior Shaylene Jefferson later testified. Suquamish Tribal Chairman Leonard Forsman, Kassia Smith, and Shaylene Jefferson of the Suquamish Tribe pour water on the banks of the Fraser River. 11 "We don't put the water right into the river," explained a participant at the ceremony. "Even just a foot away, two feet away, a yard away, as long as its flowing toward the river, that's where you pour it—because you're asking Mother Earth to continue to cleanse the water, as she has done since the beginning of time." Brian Cladoosby, the elected Chair of the Senate of the Swinomish Indian Tribal Community, speaks during the ceremony at the Fraser River. 12 "Over the last 100 years, our most sacred site, the Salish Sea, has been deeply impacted by our pollution-based economy," said Swinomish Tribal Chair and National Congress of American Indians President Brian Cladoosby. "Every kind of pollution ends up in the Salish Sea. We have decided no more, and we are stepping forward. It is up to this generation and future generations to restore and protect the precious waters of the Salish Sea." Chair Cladoosby is effectively the chief executive of the sovereign Swinomish nation and the current President of the National Congress of American Indians, which advocates for 566 tribal nations in the United States. "The place that we're living now, we've been there since time immemorial. Our roots go very deep. We are a place-based society. All of us in the Coast Salish territory are. What that means is, we just can't pick up and move to Ottawa or New York or Texas. We are where we are." The arrival into the testimony hall before the Canada's decision-making board. 13 "You're going to be hearing from several tribal leaders, fishermen, Swinomish Indian Tribal and also the next generation, the youth," Earthjustice attorney Jan Hasselman said during the hearing. 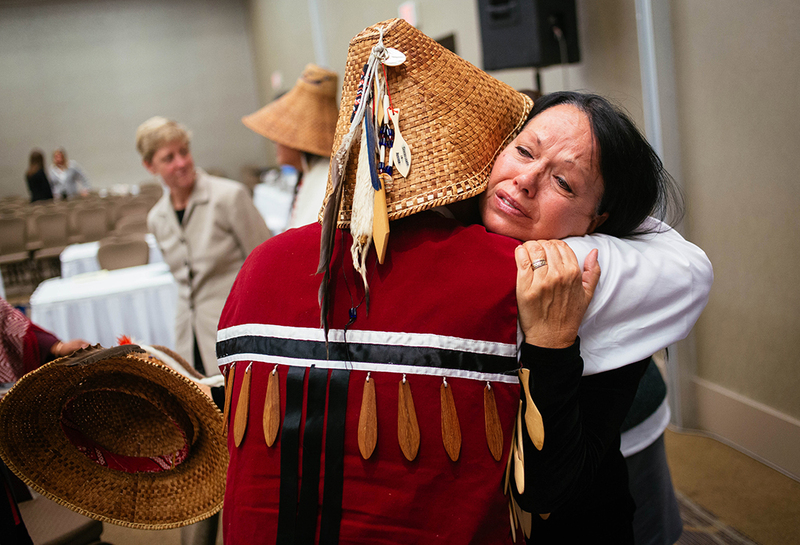 "What you're going to hear from these witnesses is a story about the U.S. Tribes' dedication to maintain their culture and their way of life, which is fundamentally tied to the natural resources of the Salish Sea." Earthjustice is representing U.S. tribes in the proceedings before the Canadian board. The U.S. tribes are coordinating with Canadian First Nations and conservation groups, including Ecojustice who is representing Living Oceans and Raincoast Conservation Foundation (two Canadian conservation groups) in the Canadian process. Read more about Ecojustice's work representing First Nations. "What you're going to learn is that, for the Coast Salish people, the salmon and other natural resources that lie at the heart of their culture have been declining for years, and they continue to decline … There are several projects, including this [pipeline], being considered right now that make this situation worse than it is today. A serious oil spill from this or one of the other major industrial projects in the Salish Sea is not a nuisance or an inconvenience. It's an existential threat to people who have lived on this landscape for hundreds of generations." Carolyn Moses of the Tulalip Tribe ceremonially wraps a blanket around NEB Panel Chair David Hamilton. 14 As is custom for government proceedings, all individuals giving official testimony before the Canadian National Energy Board were sworn in as witnesses. Other attendees, including the NEB Panel Chair were sworn in, as well, in accordance with Native tradition. 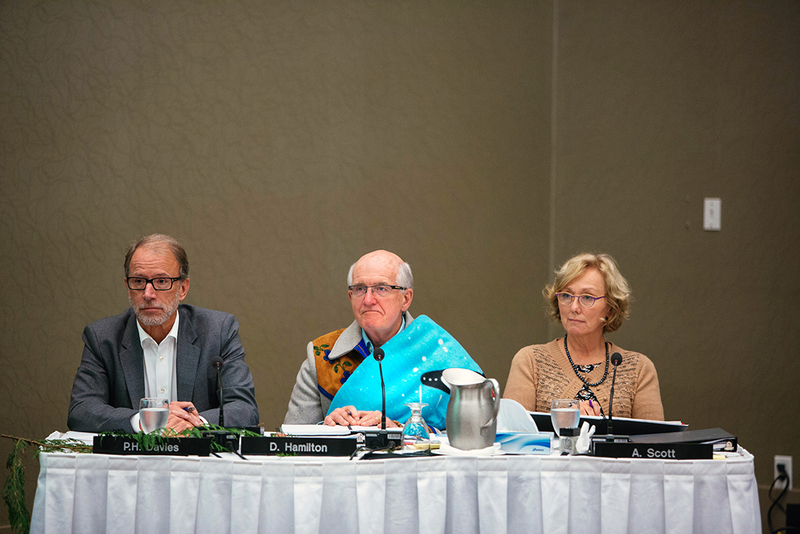 Tribal members placed a blanket around Panel Chair David Hamilton, signifying that those wrapped are called upon to accept and understand the responsibility of their post. "The obligation to the witness is that they must remember this forever," explained Ray Harris of the Stz'uminus First Nation, formerly known as the Chemainus First Nation, at the hearing. "Time and again, you'll be called on to reminisce about this day and what you have seen and witnessed and felt. The blanket is to comfort to you, to tell you that no hard feelings will come. The kerchief is for you to hold the memory of the day." Glen Gobin, Treasurer, Tulalip Board of Directors of the Tulalip Tribe, speaks in front of the Canadian National Energy Board in Chilliwack, British Columbia. 15 "We do not depend on the State for authority to go and exercise our Treaty fishing rights. We write our own regulations, we manage our own resources, and we control what our future is going to be," testified Tulalip Tribe member Glen Gobin. "The biggest threat we have, though, is what it means to our future. What does that mean for my grandchildren if a spill happens, a catastrophe happens, if I no longer can sustain my way of life? The effects that happened in Valdez with the Exxon are still being felt; it is not come back to the way it was." Earthjustice attorney Jan Hasselman, who is representing the Native groups in the legal proceedings, speaks to the Canadian National Energy Board. Also pictured are Swinomish Chairman Brian Cladoosby (left) and Canadian Coast Salish elder Ray Harris (center). 16 "The U.S. Tribes are part of a single shared culture of Coast Salish people that have lived here since time immemorial, long before there was an international border," stated attorney Jan Hasselman. "By allowing us this opportunity to speak, the Board is, I think, acknowledging that the oil tankers and the risk of oil spills from this project affect Coast Salish people on both sides of the border." "In the 1800s, the four U.S. Tribes intervening in this action, like many others, ceded legal title to their ancestral lands, but they reserved their right to continue to fish and hunt and gather in their usual and accustomed places and ways. This reservation of long-standing rights was formalized in treaties with the U.S. government, and the treaties are the legal mechanism that ensures that these people can continue fishing and other activities that lie at the core of their culture and their way of life and their economy. "They've had to fight for those rights under these treaties for many decades. They have been arrested and beaten up and thrown in jail for exercising their Treaty rights. They've had to fight in the Court system all the way up to the U.S. Supreme Court … Exercising their Treaty rights to fish and gather is not any less important to the U.S. tribes than the air they breathe, and those rights are in jeopardy because of this project." Tulalip Tribal member Patti Gobin holds the hand of young Suquamish tribal member Kassia Smith as she testifies on her behalf. 17 "I'm also speaking on behalf of [Kassia]—I call her my niece. She's from Suquamish but her great-great-grandmother was my grandmother's sister, and we just found that out today," said Tulalip Tribal member Patti Gobin. "That's how our journeys begin, and that's how our journeys end. She was to be a speaker here, but she didn't feel like her spirit is mature enough to do that yet, so I am her voice." The Canadian National Energy Board listens to testimony. From left to right, NEB members Phillip Davies, Chairman David Hamilton, and Alison Scott. 18 The National Energy Board will make the recommendation to the federal government of Canada on whether to permit the project. Because the project threatens U.S. waters, the U.S. Environmental Protection Agency can weigh in on the decision. But so far, it has kept a very low profile. Tulalip Tribal member Patti Gobin cries as she hugs her brother Glen Gobin after their testimony. 19 "I want to stress from what I've heard, and it was spoken so eloquently here by my leaders, and specifically my young leader here, that in order for our future to go on as Coast Salish people, we have to be mindful of what we're doing to the Salish Sea," testified Patti Gobin of the Tulalip Tribe. Members of the Squamish and Tsleil-Waututh First Nations gather in Burrard Inlet at the Kinder Morgan Burnaby Terminal in opposition to $5 billion TransMountain Pipeline expansion, in North Vancouver, B.C., on September 1, 2012. 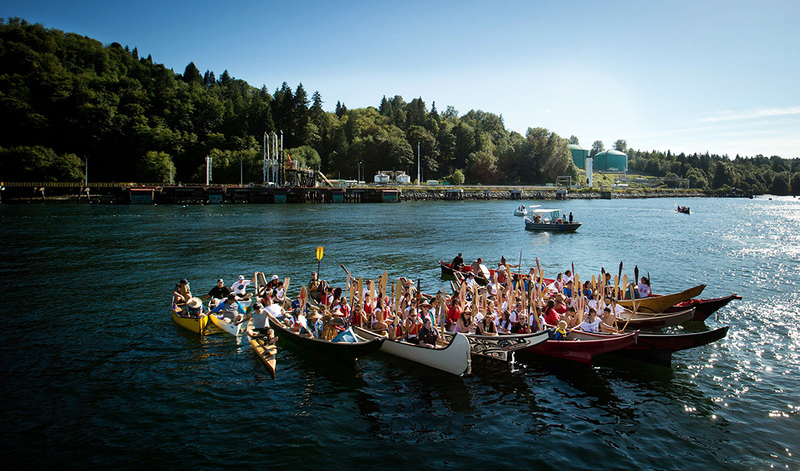 20 "Like the sea, Coast Salish people acknowledge no boundaries," said Stz'uminus First Nation member Ray Harris. "We are united to protect the Salish Sea." No Enbridge Oil Pipeline protest rally. 21 The movement to stop Kinder Morgan's tar sands pipelines and shipping terminal expansions has been gaining momentum. 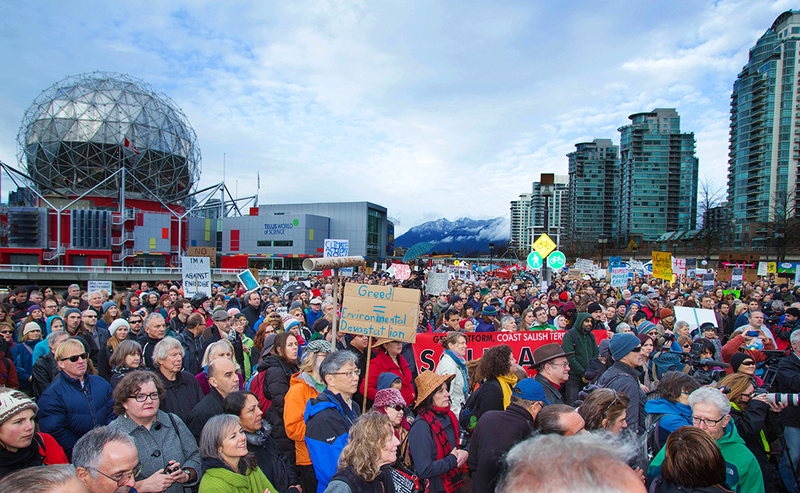 In November, hundreds took to the streets of Vancouver to protest increased tankers and pipelines in the Salish Sea. 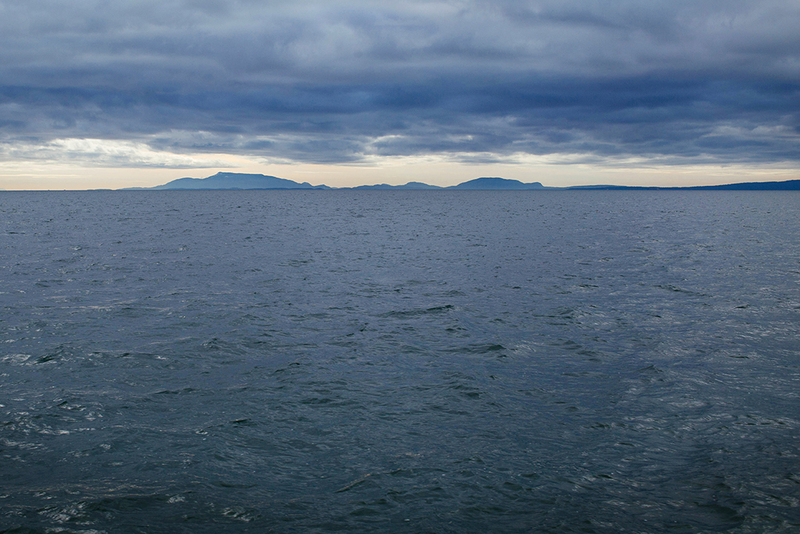 The Salish Sea near the U.S.-Canada border. 22 "We, as Indian people, Coast Salish people, we believe that we are the voice for Mother Nature," said Glen Gobin of the Tulalip Tribe. "Mother Nature cannot tell us what's going wrong. She can give us indications, but she can't speak the same way that we do. We have to be that voice. We have to recognize that." By Chris Jordan-Bloch and Liz Judge.